There is no one right color eye shadow for brown eyes and black hair. Depending on your skin tone, you can wear nearly any color. The woman with brown eyes and black hair can use browns, blues, greens, purples, rosy pinks and some shades of orange to create the perfect look from conservative daytime to smoky evening styles. You can even use shades of gray and black, although these darker colors are best used as accents. Natural Smoke by Maybelline. Four shades of color ranging from cream to deep brown provide the perfect palette for day or evening. Brun is a wonderfully luscious black-ish brown by MAC. This shadow provides just the right amount of shimmer. It's the perfect shade of brown to make the eyes pop, but not too much. Pulling off blue eye shadow can be difficult, but it's worth it. The right shade of blue can put a sparkle in your brown eyes. Pay close attention to your skin tone on this one. Some shades just don't work with certain skin tones. Icy blues are the most likely to work with nearly any tone, however, and pair perfectly with black hair. Check out Bare Escentuals for several tones of blue -- such as Bunny Hop, Showers, and Liberty -- that can work for you. With a myriad of shades to choose from, purple is the perfect color to pair with black hair and brown eyes. Darker purples can create a great evening look. Purple Pop is a purple shade with slightly pink undertones from Covergirl. It looks great on women with darker skin tones. The Smokey Orchid Duo by NARS is a great dark purple to use for an evening on the town. You can use the lighter shade as an accent color. 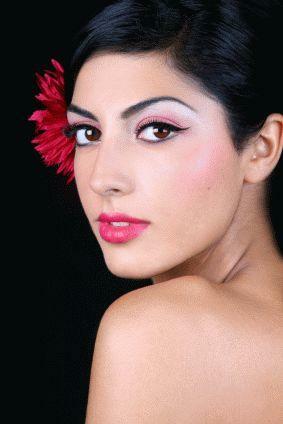 Rosy pink eye shadow will give you a fresh, feminine look. This is another color where you have to consider your skin color. Go too light and you'll look washed out, especially if you have a darker skin tone, but choose the right shade and you'll be pretty in pink. Laura Mercier's Kir Royal Sateen Eye Color is the perfect purple to complement your brown eyes. Green is one of the best colors for making brown eyes pop. Green can also play off either the warm or the cool tones in black hair, allowing you to find the perfect shade for you, because greens can run the spectrum from blue to brown in hue. Check out Senna Cosmetics Glow Eye Color in De-Vine for a khaki colored green that plays up nearly all shades of brown eyes. The trick to using the right shade of orange is to find one that borders on bronze to bring out the highlights and tones of your eye color, without clashing with your hair. Look for a color that merges more with metallics and less with yellow hues, which can make you look sallow. A great shade to try is MAC's Amber Lights. It borders more on brown than on peach, which can add depth to your eyes without being too light. Black and gray really work best for evening looks or for creating the perfect smoky eye. Take care that you don't go too dark, or into a flat black color; with dark eyes and black hair, black eyeshadow can be overkill. Instead, opt for a lighter, silver-toned shade that has a little sparkle or metallic edge to it. This will make your hair look darker, and your eyes come alive. Try MAC's Electra for a light, shimmery color, and accent it with some black liner. If you're still not sure which makeup shades to use for your dark hair and eyes, you can always get a professional opinion. Many cosmetic manufacturers offer color-matching tools on their websites. Some even allow you to upload your photo to find the perfect eye shadow. You can try various shades and colors until you find one you like best. You can also chat with a beauty consultant online. For a more personal touch, try the cosmetics counter at any major department store. 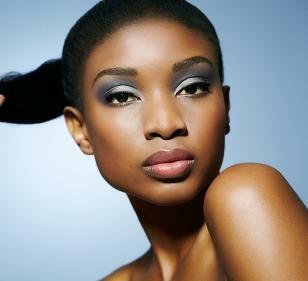 The salespeople can help you find the perfect eye shadow for brown eyes and black hair. Remember that your brown eyes and black hair may have highlights or undertones that mean they'll work better with one shade over another. Try out several samples and colors, and don't be afraid to try some that you wouldn't ordinarily consider. Amass an array of colors that work for you and know that you're all set day or night, whatever the season.